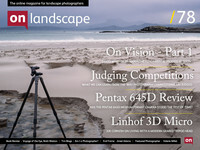 Tim Blogs – Am I still a landscape photographer ? Standing in for Joe this issue Tim reflects on how is time is (mis)spent ! Andrew Nadolski is a professional designer and photographer based in Exeter. His series 'The End of the Land' has been exhibited in museums and art galleries across England and has been published as a book by Headon House. The Nikon D800 – The Landscape Shooter’s DSLR?